glenderella | Knitting, crocheting and burning down the kitchen. I need to make a note for the future that day 4 of vacation is the day we will need a nap in the afternoon. Headed out for breakfast at 8 at the Lighthouse Café, I had read plenty about their whole wheat blueberry pancakes on TripAdvisor, so that is what I had to order. I usually not a sweet breakfast person, so this didn’t really do it for me – had to order a side of bacon to get some protein. And Ken had to have bacon with his pancakes because, well, that is what he does. Did not have a mimosa this morning because I decided that was what was making me too full. The Lighthouse Café is appropriately decorated with all kinds of pictures of lighthouses from around the world and we had fun looking at those and finding the ones in Michigan we remember from living there. Then we headed over to the Dunes Golf Club, Ken to golf and me to ride along and hopefully see interesting wildlife. We were paired up with an older gentleman who still lives in Vermont 8 months of the year but he and his wife then come down to Sanibel for 4 months of the year. That was kind of nice because he knew all the holes and gave Ken pointers. And kept close track of the scores. We did see a small gator on one hole, but the sign warning you to enjoy them at a distance was almost as enjoyable. Saw a spectacular eagle/osprey mid-air fight with the eagle trying to get a fish away from the osprey. He did finally get the osprey to drop the fish in the water and he snatched it up. The tour guide at the wildlife park says this is quite common behavior for eagles. Saw lots of ibis and cormorants, and a great blue heron and two big birds I am referring to as storks for now because I couldn’t find any other pictures of them (after searching I am pretty sure they are wood storks). Ken liked both courses he played here but he lost less balls on this one. 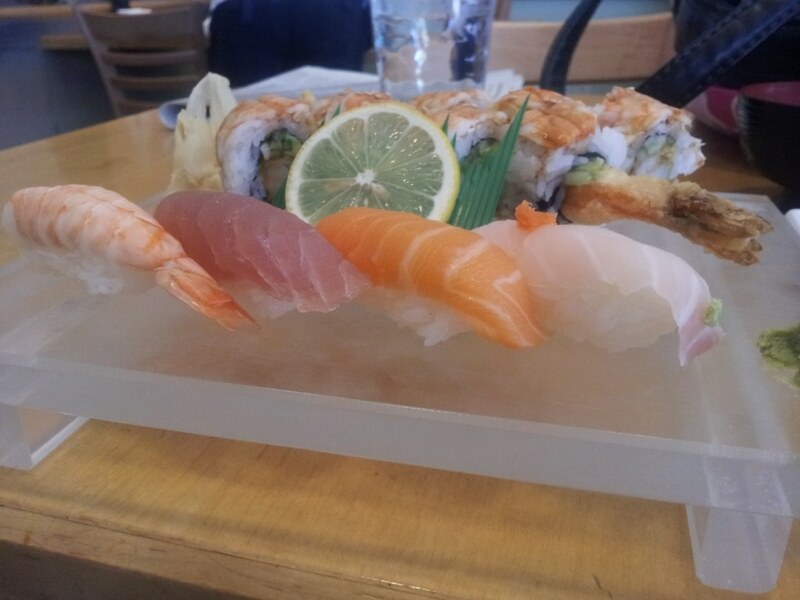 Note the fish-shaped plate for the salad. And then we went back to the hotel and crashed. We both napped. I think we had hit the vacation wall, especially after being out in the heat and sun all morning. We just took it easy after we woke up but did go out to see our last Sanibel sunset. We sat and watched the sunset and birds and people and the brown pelicans dive bombing for fish, and then we saw a bunch of osprey also fishing, so we watched them for quite a while. It had had been windy for the last few days, and we hadn’t seen any of the no-see-ums (sand fleas? Biting flies) that I had read complaints about. Well, they were out in full force that evening, and I apparently am quite tasty, because Ken had just a few bites and I have about 40 on each leg, and apparently I am a bit allergic to them because they are quite red and itchy, still, 4 days later. Went to Matzaluna’s for dinner – the secret seems to be to go to dinner pretty late if you want to miss the rush. We went about 7:30 and were seated by 8. Ken had pepperoni pizza and I had guava salmon – it was fine but not “different” enough for me – if you couldn’t tell, I am all about the unique and new tastes. Ken had a pina colada and I had a strawberry daiquiri. And then we went back to the hotel and started getting organized to pack….sigh…..
Sunday morning started out with me having to get serious about writing a newsletter for a club I belong to, so I went down to the beach at about 6:40 a.m. to do that and catch the sunrise. Well, I caught the sunrise but the wireless was not reaching down to the beach so I came back up and sat by the pool to finish it up. By the time I returned to the hotel room at 8, Ken was in the shower. When he got out he informed me that #1 he got a cold shower and #2 the people next door are even noisier than I am in the morning. He he he. The J.N. Ding Darling National Wildlife Refuge opened at 8, so I called them to see when their first tram tour was, and made reservations to go on that at 10:00 a.m. Went back to Rosies to eat breakfast because there were several things on their menu that caught my eye. I had the French Rose benedict on a croissant with mushrooms, ham, swiss cheese, green onions, Ken had bacon and eggs, do we sense a theme here? And I had a pineapple juice mimosa. Then we headed to the wildlife refuge. After a brief detour to the wrong place, we got there and got in the tram with 4 other people, so it was a rather personalized tour. This little guy wanted to come along. Alligator #2, just hanging out. We didn’t even see him blink. Alligator #3, to the right. You might want to keep your children back a little further than that. Alligator #4 decided to take off and swim while we were watching. Lots of birds: pelicans, osprey, cormorants, roseate spoonbills, and an anhinga who nicely demonstrated his fish spearing and throwing abilities for us. We were there at low tide so there were lots of birds on the sandbars, fishing and eating. There is a stop set up in the mangroves, where you can see the three different species of mangroves and hear about how they affect the ecosystem of the island. And see the kind of disturbing little crabs that live in one of the species. We wouldn’t have even noticed them if we weren’t with the tour guide, they just look like knots on the tree. Until you look at them. They don’t like you looking at them and they will sidle around to the back of the tree. On the way back to the hotel I suddenly remembered (well, OK, I saw the signs) for the Sanibel Farmers Market, which I had been intending to get to. So we stopped and did that. Nice mix of produce booths, food booths, and hand crafted soaps, etc. Not too many chiropractic/make up/solar panel offerings. Bought some local honey and some cut up pineapple to snack on. As we were walking around, I heard Ken saying “Uh oh, uh oh,” and wondered what was going on, well, he had sighted the mini-donut booth. YES! (Given the opportunity to get mini donuts, I WILL NOT pass it up.) Well, it was close to the end of the market, and rather than a baker’s dozen, I think we got about 24 mini donuts, so that was ok. We have to move down here now, they have mini donuts. We had asked at the visitor center at the wildlife refuge about the different low tide times we saw listed for different beaches – well, each beach on the island is in such a different place/angle to the gulf, they all have pretty different tide times. So we zipped back to the hotel and changed into beach gear and hit Bowmans’ Beach which had a later low tide than the one by our hotel. Found some more shells, still a couple types I haven’t even seen yet. Mostly pretty small ones, but it is fun. Ken wore his Broncos t-shirt and consequently we had some interesting conversations with some New England fans (Sanibel tourists are heavily weighted toward New England), including a couple who had just moved down to the Venice area from Boston, after Boston’s horrible winter last year. I wore the new red hat, which had dried out over night. Apparently a good soaking shrunk it a bit because it did not blow off today. We were loading up to walk down to the beach and Ken had me put his phone, cash, driver’s license in my fanny pack (I am soooo cool and you know it, plus I clip my shelling bag ONTO the fanny pack, making it EXTRA cool). He wondered why I was then wrapping up both of our phones in a plastic grocery bag – “Because I might trip and fall in the ocean.” It was obvious both that he hadn’t considered this and that he thought it was a very likely possibility that I would do just that. We stayed there for about two hours, probably the highest concentration of shells we have seen. Mostly small ones but it was fun to look and Ken did find a nice whelk that I only had one of so far. Another shelling note: G. will pick up ANYTHING, and squeeze it and possibly smell it to try and determine what it might be. Ken does not want to participate in this sort of activity. G. likes to be on the move, up and down the beach. K. will stand in one place in the water and pick up handfuls of shells and sift through them. I picked up the Sunday New York Times in the hotel office for some reading material, and we went out to hang out on our beach and watch the sunset. And then back to the room for thankfully warm showers this time. 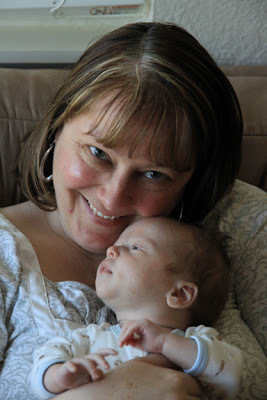 We relaxed and watched football on TV and I worked on the blog. We waited to go out to dinner until it was almost time for the Broncos game to start, at 8:30. That will be the difficult part when we win the lottery and buy a house on Sanibel, Sunday night football starts really late. We at at George and Wendy’s, I had investigated them on line and it sounded like they had a bunch of TVs and good specials during the game. I asked the young man who was seating us to make sure they would be open late enough. “Ma’am, we’ll be open until the game is over.” Because Sanibel appears to be kind of quiet on Sunday nights. I had clam chowder (first clam chowder of the week) and the tuna nachos (the chip part is fried wontons) and Ken had a bacon cheeseburger. I also had a Twisted Flamingo, described as: classic Pina colada and strawberry daiquiri blended with Captain Morgan and topped with a 151 Bacardi floater. It was tasty. The nachos were good, but if you eat all of those chips you will be really full, I carefully structured and rearranged my chips so there was a bunch of seared tuna on each of them and then it wasn’t too bad. We were hoping for a packed bar full of football fans, but it was rather quiet, a few more people came in as the game progressed, but there were probably a dozen of us in the bar total. And only one apparent real Patriots fan, and he certainly got more enjoyment out of the first half than we did! We left at half time because it was already 10 o’clock. Went back to the room and got ready for bed and kept watching – although I fell asleep so I am not even sure at this point who won…ooop looks like the Broncos won! Hopefully Ken stayed awake for that! If he did, he showed remarkable restraint, no whooping and hollering to wake up his sleeping wife. (Ken later reports he turned the TV off after the Patriots scored a touchdown in the early 4th quarter, making the score 21-7, at 11 p.m. our time. So he is actually glad he turned it off, because we have an early tee time on Monday and it would have taken him quite a while to settle down after that 4th quarter and overtime. AND he certainly would have woken his wife up, which means NO ONE is going to be happy…..) So it is has been fun Monday morning reading all the Broncos comments on Facebook. The proper reaction when your wife’s new hat blows off and she has to chase it down the beach is NOT to tell her how funny that is. The proper reaction when your wife’s new hat blows into the ocean is NOT to tell her that is even funnier. I thought I had clued Ken in enough on the plans to get up and take sunrise pictures but he was still somewhat reluctant. Sunrise is pretty late here, about 6:55 or 7 but it is pretty light before then. The cool thing is that it is also pretty close to low tide, so you have access to much more of the beach than before and tide pools are left behind with interesting things like horseshoe crabs, starfish, fighting conchs and sand dollars. Yesterday I saw a lot of sand dollars, but lucky for them, they were all still alive – but today there were some expired ones so I was able to pick up a few. After sunrise and collecting a few shells at our home beach, we hopped in the car and drove down to light house beach, finding different kinds of shells and seeing a funny little leopard crab enjoying the day, and an osprey hanging out in a tree eating a fish. We also saw two starfish, both still alive and kicking, so we just took a picture and made sure they were returned safely to the water. I did some research on something I found yesterday (and returned to the water) and it was a big chunk of sea pork, bright orange in color. Went to breakfast at Sanibel Cafe – Ken had bacon and eggs and I had a mango mimosa, smoked salmon eggs benedict, and parmesan grilled tomatoes, which were excellent. I need to figure out a way to make those at home. Of course, the tomatoes are probably from within the state and were far better than most winter tomatoes. Cute little family run restaurant with seashells displayed in the tables. The waitress was wearing a Tim Tebow jersey (FL/FL State game today) and so Ken had fun giving her a bad time about that. Walked down the rest of the shopping area to check out shops and found one with super soft hoodies so that is going to be my clothing souvenir. Then went to CVS in hopes of finding a flash drive so we can store a few more pictures, found one, got some water for Ken who dislikes the FL Sulphur water, some snacks, and another hat for me since I only own about 20 hats but I am incapable of remembering to bring one on any given trip. I found a new hat but you know how that turned out already. 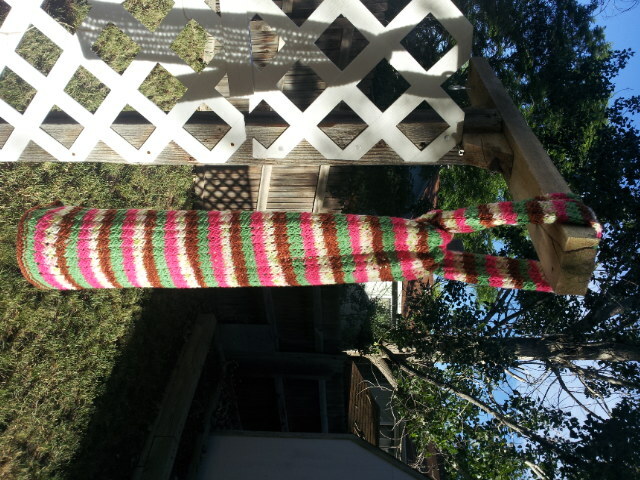 The hat got rinsed out and hung on the patio to dry. We went back to the hotel and changed into swim gear, and went down to the beach and sat on the loungers under the umbrella while I typed up Friday’s blog. Then we did some beach walking, finding a few more shells vital to my collection. I am more than willing to pick up just about anything I see on the beach and scrutinize it to determine what it might be. I am pretty sure I returned a sea cucumber to the ocean this morning. Ken, on the other hand, does not care to closely examine the cute little dead crab when I am more than willing to hold it RIGHT CLOSE to his face. Lunch was at the Island Cow- very extensive menu but I had scoped things out online beforehand and knew I wanted Stone Crab if it was in season. We started out with pina coladas for lunch, hey we are on vacation. Meanwhile we are looking at pictures from and the ice skating is open for the season in Denver. NOT SAD TO BE HERE. I had the stone crab with cheese grits and hush puppies for sides, Ken had the pulled pork platter with fries, it also came with cole slaw and hush puppies. Ken said the pulled pork was good but too filling, he then complained all afternoon about being too full to eat ever again. He said the sauce was good but the texture of the pork was more “mashed” than what he was used to, but very good. I would have eaten his hush puppies had they been good but they were not very hot and fresh. The cheese grits were excellent, good grits with two kinds of cheese on top, not melted and stirred in, but very good tasting. 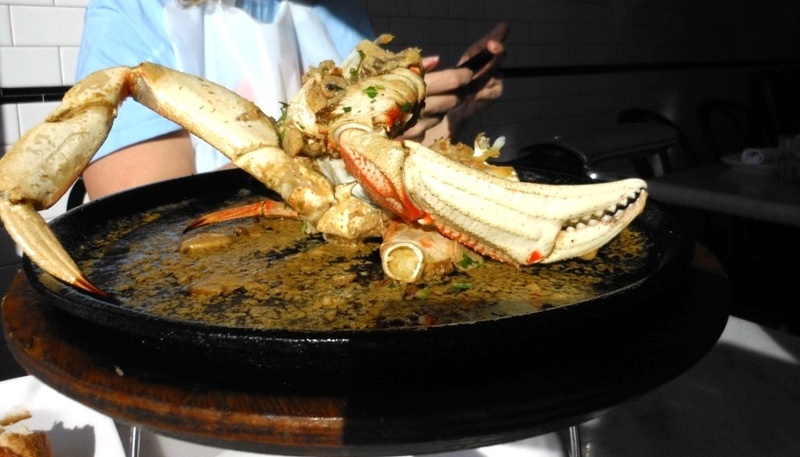 I am starting to realize when I say “I am going to eat a lot of seafood” I mean “shellfish” because that is what I have had at every meal – and lunch was no exception with the stone crab claws. Stone crab claws are very good but unfortunately the shell is very thick, so there is sometimes shrapnel. I kept the shrapnel to a minimum this time (we were eating outside, that was helpful) but there was spray, Ken got it in the face once, and I had to go back and change my shirt afterward, and there is no “just spot cleaning” that shirt, it went in the laundry right away. I think the drawn butter caused much of the problem. I also saw they had a draft root beer which I had to try, not local to Florida but local to the south, Abita root beer from Louisiana, sweetened with Louisiana cane sugar. It was also tasty. Fun place to eat. I might try it again if I didn’t have 15 restaurants on my list and only 8 or 9 meals left…. Then we came back to the hotel, it was already after 3 at this point, and started listening/watching the Jackrabbit football game on ESPN 3 on the computer. Well, I was listening, someone else needed a nap and fell asleep. I was considering going shopping but decided I didn’t have that much time, as we were planning on heading up to a more west-facing beach for sunset pictures. So I caught up on Facebook while listening to the game and investigated which restaurant we should go to tonight, and tried to determine a plan for going to the wildlife refuge at some point. And the Jackrabbit game was not going well so it was no sacrifice to leave it and drive up to Blind Pass beach, which is the very first point of land on Captiva Island, and faces west, to get sunset shots. And I was hoping for more shells, but there were very few up there, sad! But we did get some spectacular sunset pictures. And even though the Jackrabbits lost, we did have the weather here for consolation. Tonight’s dinner was Doc Ford’s Sanibel Bar and Grill. It was a bit of a drive back up toward Captiva Island, but now we knew where we were going. We had the Doc’s Beach Bread “baked French bread topped with three cheeses, diced tomatoes and just the right spices.” And added bacon because, well, bacon. I had the conch chowder, very interesting version, lots of vegetables, pretty spicy, and the Yucatan Shrimp, which were peel and eat shrimp bathed in butter and spices, and supposedly cilantro, but I didn’t see a trace of that. They were tasty but there was so much butter I had to be extremely careful so as to not trash another shirt that I couldn’t re-wear again. Ken had the baby back ribs, and he said they were good, but too much food after he had a big lunch earlier in the day. We both had excellent drinks, I think mine was called the Sanibel Sunrise, and Ken had a rum and coke – Doc’s has a lot of specialty rums so that was fun. Posting this from the beach, this hotel really has pretty decent wi-fi, I am impressed! Our hotel room is the 2nd from the left. I keep trying to go in the first one, pictured here (you can’t see our room off to the right in this shot.) Good thing Ken is along to keep me from doing that. The first night in a strange hotel is always rough. The bed is far softer than we are used to and a bit smaller. And we were sleeping with the screen door open to hear the ocean and so we also consequently had the crap startled out of us when the sprinklers went off. We didn’t get to sleep until after midnight because of the time change, but because of the late football game, the local news was on that late, so we watched a little bit of that. Ken was hot and I was perfectly comfortable but we were both restless. I got up relatively early (6:45) to get down to the beach for sunrise. Of course, I was distracted by the shells and didn’t get many pictures. Sunrise was also pretty close to low tide. Saw lots and lots of sand dollars (all still alive so I didn’t collect any) and lots of fighting conchs, also still alive. And assorted other shells occupied by little tiny crabs who did not appreciate being picked up and scrutinized and put back. Ken had golf booked at Sanibel Island Golf Club, so I was able to get him awake with minimal complaining. We want for breakfast at Bennett’s Fresh Roast, known for their coffee and donuts. Well, we didn’t indulge in any coffee but Ken had the donuts covered, of course he isn’t interested in trying any of the crazy flavors like maple bacon. I had researched in advance and knew they had breakfast strata, which is kind of an unusual dish for restaurants, but a good way to have an egg dish without having a short order cook in the back. I had the strata and breakfast potatoes and Ken had two donuts and a side of bacon. Thumbs up on the strata and breakfast potatoes. Then I dropped him off at the golf course, early, so he could hit range balls, which he later learned was a lost cause because they didn’t have a range. I went to Jerry’s, the island grocery store, to check things out and buy sunscreen, a shelling bag, and tea bags. We get a continental breakfast basket delivered to the room but it doesn’t include tea bags. Fun little boutique grocery store. Since my job is food/agriculture, I enjoy checking out the different variety of foods available in grocery stores around the country. Got my shell bag – the appropriate kind of bag to tote your shells in them while you are collecting them is a fabric mesh bag, so the water and sand can drain/sift out while you are toting them around. I went back to the hotel, put on my swim suit, slathered on the 50 spf sunscreen, and headed out. I walked about ½ mile west from our hotel, looking at shells and people watching. My secret to shelling is channel your inner 5-year old. Stop and look at the dead crab. Kneel down and examine him closely. Because no one else has been looking at the dead crab and there are several good shells right around him. But then I also discovered that all the hotels/condos look the same from the beach, and since I am really good at getting disoriented anyway….it was interesting finding my way back. But our hotel has beach chairs with umbrellas, and nice palm trees in the pool area, so that helped. And I made my way back and laid out my shells to dry and decided to go get lunch. While making plans for this trip there were several places I was interested in eating, but I had my doubts about whether Ken would find much on the menu, so I went one of those places for lunch. At Traders, I had white gazpacho – the white was obviously cream with maybe a touch of sour cream, there were cucumbers, tomatoes, and flakes almonds on top – amazing, quite unlike anything I had ever tried before. (I will always go for the item on the menu that I have never tried.) And the roasted oysters Florentine, which were also fabulous, spinach and butter and maybe a little parmesan – just perfect. The complimentary bread was multi-grain and full of interesting seeds, and the dipping oil with herbs was more interesting than the usual. Not sure what was in there but it was tasty, maybe the herbs were fresh. I didn’t pay attention at the time, but that seems to be a big thing at restaurants down here, and so now I am going to have to compare different versions…..And an excellent beer – Lazy Magnolia Pecan. The bartender offered me a second beer that had been poured by accident. Not being used to drinking beer at lunch and being responsible for driving our ultra-fancy rental Kia Soul, I had to say no. All in all, one of the best meals of the year. Then I decided to just drive around a bit, but before I got too far, Ken called from the golf course, so I picked him up. His assessment of golfing: he is out of practice from not playing for over a month, so it took a while to get warmed up, and they didn’t have a range to warm up on. Their grass here is different, way different to hit balls out of. While we were at the arts festival later he was pointing out to me the different kinds. He also said it was at least a club different from playing at 5280 feet like we are used to at home. He played with a nice couple from Cincinnati, the wife said Ken reminded her of his son. After I picked him up we came back to the hotel briefly and put our feet up before deciding to go to an art festival that was in town for the weekend. We didn’t find anything we needed there but had fun looking. It was starting to wrap up, close to 4 p.m., so we headed back to the hotel to hang out and wait for sunset. Because of the way the island is situated, we weren’t going to get a perfect beach sunset, on Saturday we will try finding a beach that faces more west. It was fun though watching the sunset and the pelicans hunting, then pretty much slam themselves beak first into the water in search of fish, and Ken got some decent pictures. Above pictures are mine, Ken’s at the end of the post. After showers we went to dinner at Rosie’s – a place I had picked out after research on the internet. Ken had grilled grouper and I had tropical bouilliabaise and Truffled Clams Casino. 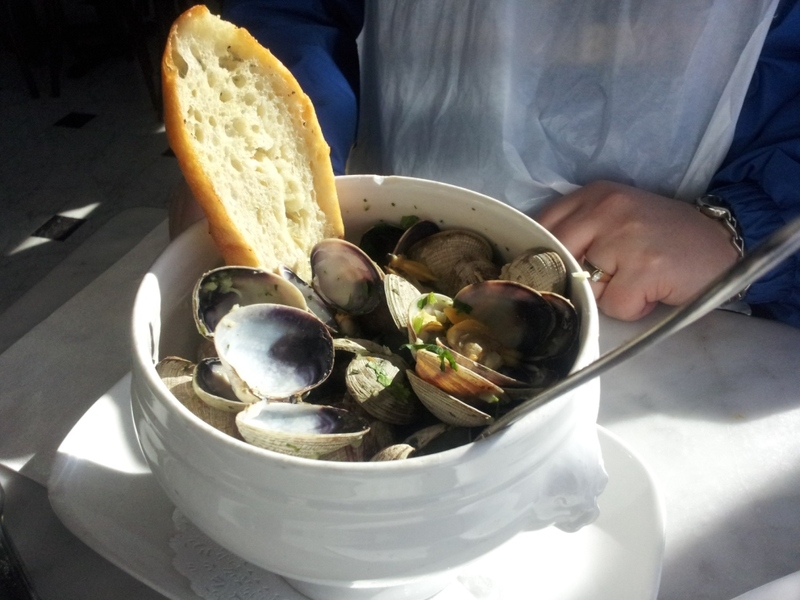 The bouillabaisse was good, the clams would have benefited from more less red onion, it was rather overpowering. They have an ice cream shop as well, and Ken got ice cream with his meal, they had chocolate chip so all was right in his world. After getting back to the hotel we headed out to get some night shots on the beach before the moon came up, and then some shots with the moon. The tripod immediately broke, so that didn’t really help things but Ken still got some good shots. Then he tried to crash my computer editing them (the little acer laptop can’t handle to many 300 mg files) so that was entertaining for a while. And this is the east coast so their EARLY news is 10:00 p.m., not 9 p.m. like we are used to – we are old, we need to go to bed! The blog comes back to life! On a trip to Sanibel Island! Well, since I renewed my domain name a few days ago, perhaps I should post here every now and then. So here I go with a trip report on our 2015 Thanksgiving Vacation to Sanibel Island. Sanibel has been on my bucket list for several years, I can’t remember when I stumbled across it on the internet, but maybe when I was researching for a work trip to Tampa. That trip I only made it to Clearwater beach, but I was determined to get to Sanibel and its seashells someday, inspired by http://www.iloveshelling.com/blog/ and her shelling tales. And since it is in the teens back in Denver, and 80s here, this seems like an ideal time. This is what happens when you own three pair of sandals that are the same style but different colors – you go on vacation with four shoes and only have one pair, but three of a kind. Not the best poker hand, even for shoes. But I get the idea that you don’t really need that many shoes around here. Going through the body scanner, the TSA agent accidentally scanned me as male the first time through, and had to rescan me. Of course an extended conversation ensued between Ken and the agent, concluding with the agent proclaiming “She’s all woman as far as I’m concerned,” and Ken replying, “I hope so, I’m married to her.” This after Ken requested a copy of the scan of me as a boy. We have more adventures before we get on the plane than most people do on an entire vacation. We were flying Frontier out of A Concourse, but my tradition (if I am not running for the plane because I am late) is to go out to Concourse C and get a breakfast calzone at Villa Italian. Well, it isn’t a calzone any more, they discontinued those, which is unfortunate, because I miss the green peppers in those, but they have two different kinds of breakfast Stromboli, I got the one with spinach. And extra sauce. Full plane to Tampa, several kids but they were all pretty quiet. I decided the knit hat I was working on for a Christmas present was WAAAAY too huge and ripped it out. 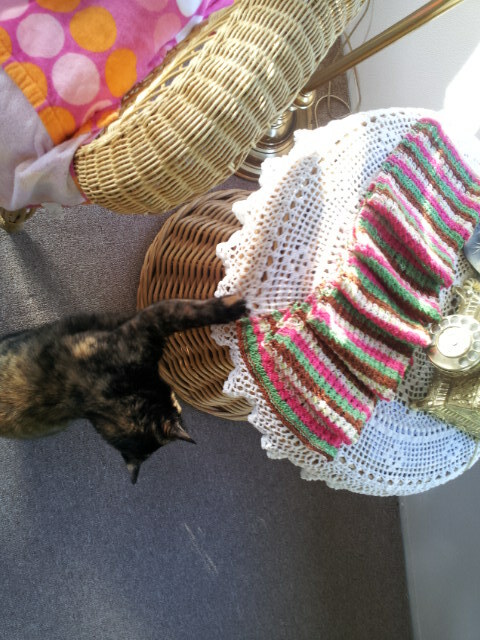 And then ripped it out again when I figured out I had twisted the join knitting in the round, so it was a moebius hat. That works OK for cowls but not for hats. AND the first time I had cast this hat on, I had also twisted the join, so this is the 4th time I have cast on this hat. It is beginning to haunt me. It was a bit of a drive from Tampa to Sanibel, but the flights into Tampa were much cheaper than the ones to Fort Myers, although next time I think convenience will win out. Tampa has this extremely spectacular bridge on the causeway heading out of town, of course they don’t want you to stop and take pictures – if you don’t want people to take pictures then you need to tone down your architecture! We didn’t get to Sanibel until just after sunset, so we had to find our way around in the dark, my bossy GPS on my phone was a big help. She only occasionally tries to kill us. This island is extremely dark, not a lot of street lights and not a lot of lighting around buildings, it is kind of strange. And people are quite comfortable walking around in the dark in dark clothes, riding their bikes with no reflective gear, etc…..eeek! There is an almost-full moon, enough light to walk out to the beach in the moonlight. Our room is literally about 50 yards from the ocean (a good sand wedge, DH says). We have the sliding patio door open right now and can hear the surf. And a cricket. We saw 2” lizard on the wall above our door and now Ken is paranoid that he is going to get a lizard in his shoe. Apparently he is not paranoid about having one waltz across his face while he is sleeping, but he doesn’t want one in his shoe. Especially, god forbid, the golf shoes…. Had Thanksgiving evening buffet at a local hotel that was pretty highly recommended on the internet, and it was just OK, had all the requisites, I guess, but I wasn’t overly thrilled with any one thing. The best things were: mango chutney for the ham, fresh cherry tomatoes and fresh pineapple. I guess maybe I really have re-set my tastebuds the last several months. And I appreciate local produce. Had a nice glass of Pino Grigio and then was charged for the full bottle, glad I noticed……it was a nice glass of wine but not a $39 glass of wine. Sunrise is at 7 a.m., we need to be up about then to get breakfast and get Ken to the golf course, and me out to the beach…..I already picked up my first two shells tonight, we will see what high tide brings tomorrow morning. The little one is actually a very metallic purple, a good find for the first night after dark! Ken has already taken some really neat photos in the dark! Some more catching up in the New Year. Hopefully, I will get back to blogging more regularly, and these entries will be a little more coherent, rather than inspired by my pictures and what I can remember. I actually finished a project this weekend, a hat for my niece. Will wait until she receives it to post pictures. I was developing a pattern from a picture, and it is not quite exact, but hopefully she (and her mom) will like it. If I make another one, I will have a better idea of how to do it. 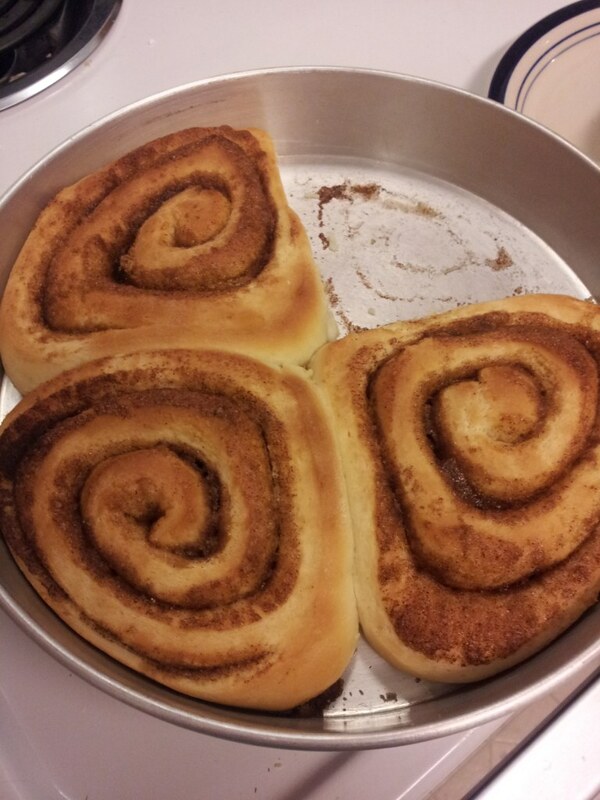 Here are some cinnamon rolls I made this fall – it is strange for me to make cinnamon rolls because I grew up eating caramel rolls and calling them cinnamon rolls. 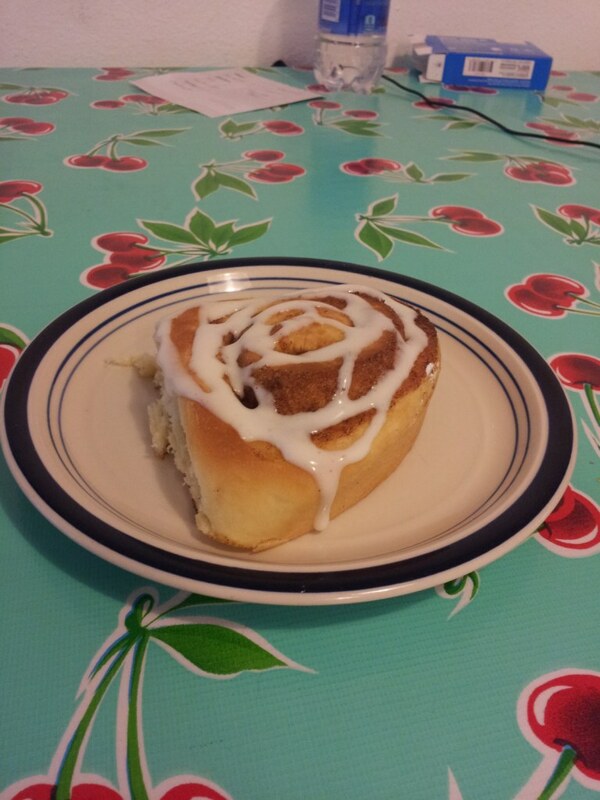 But the DH prefers cinnamon rolls, so I usually make them. Using the Speedy Roll dough recipe. I also ate at Panera bread this fall, specifically to try their seasonal menu items. Of course, then I neglected to get this posted while they were still available. But maybe they will bring these back. 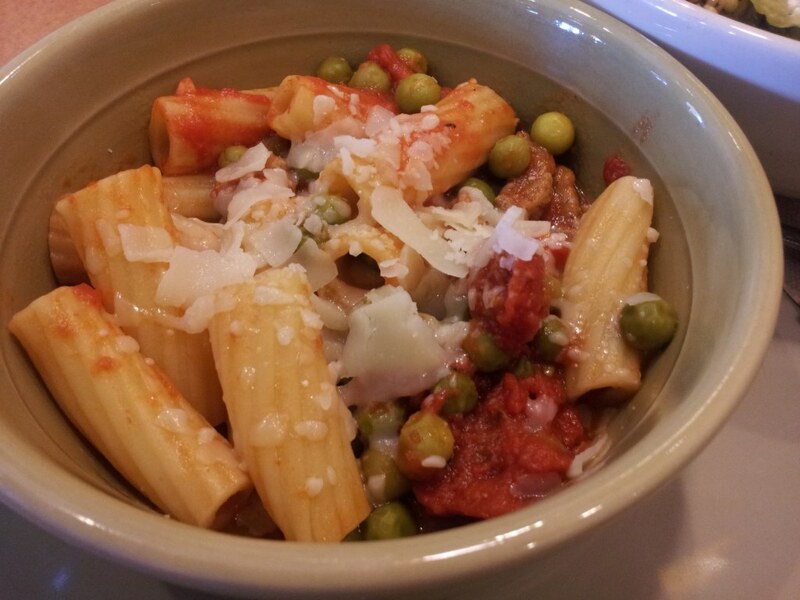 The Rigatoni San Marzano pasta – this was OK. The tomatoes in the sauce were nice, the peas were pretty pointless. The sausage in the sauce was good. Panera does a good job of cooking the pasta al dente, at least at the Panera shops I have been to. 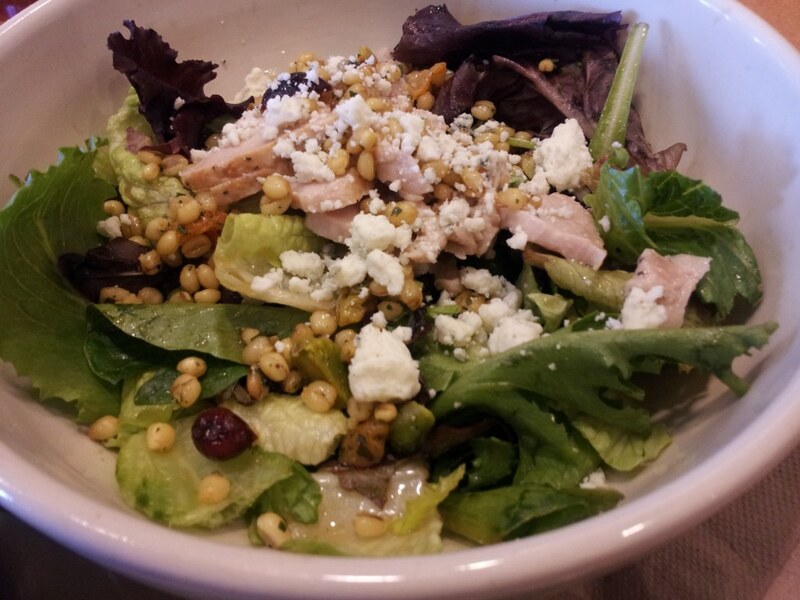 The turkey harvest wheatberry salad was also tasty, the wheat berries were a little soggy but I liked the vinaigrette. 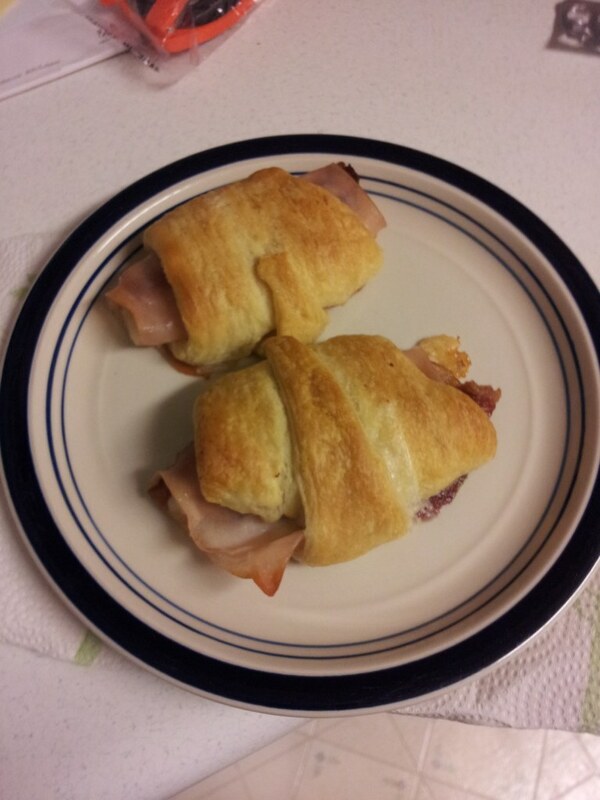 Quick dinner idea: roll up ham and cheese in crescent rolls and back. The DH will eat just about anything rolled up in a crescent roll. (Well, so will I.) Easy dinner for work nights, with a green salad or vegetable. Tried a new place in Westminster, Goody’s Eatery, for breakfast. Two thumbs up! Nice decor, friendly staff, good food. 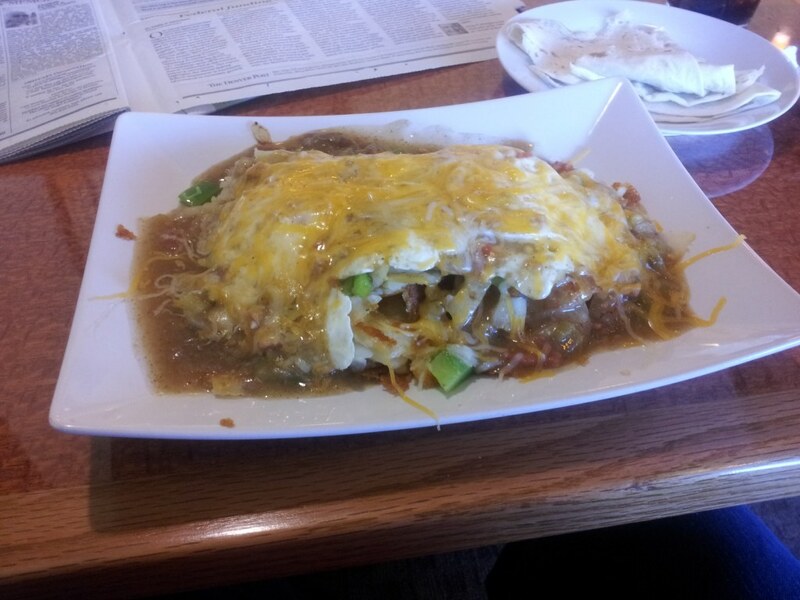 I had the Huevos Garcia Hashbrowns, green peppers and onions, PKWY green chile, melted cheddar jack, two eggs over easy. Sushi Lunch, Taigun, Broomfield, Colo.
And this is the duck ramen at Uncle – finally got to go there with my friend E. We had the brussels sprouts for an appetizer, which were amazing. If I could figure out how to make those we would be having brussels sprouts once a week. Well, I would be having them, at least…..
Well, my oldest niece thinks that one of my New Year’s resolutions should be to blog more often, so here we go. Back in October, I made my annual trek to Mom and Dad’s ranch near Hermosa, SD, for the annual Community Club Bazaar. Well, unfortunately, the Bazaar was derailed by the Atlas blizzard. Instead of a fun community get-together, we had rain, freezing rain, high winds, and then a true blizzard. Many, many neighbors lost cattle in this storm. At the ranch, we were without power for five days and phone for four days. But all that gets an entry of its own, later. Here are the things that I made for the Bazaar! Some of them ended up being sold at the (postponed and modified) Bazaar, while some of them we donated to the Soup and Pie supper at my Mom’s church. I did forget to take a picture of the afghan – this was a crocheted afghan that someone else started, and then passed on to a knitting friend of mine who wasn’t really interested in finishing it, so she passed it on to me, and I finished it and donated it to the Bazaar, where it surprised us all by selling for $95! 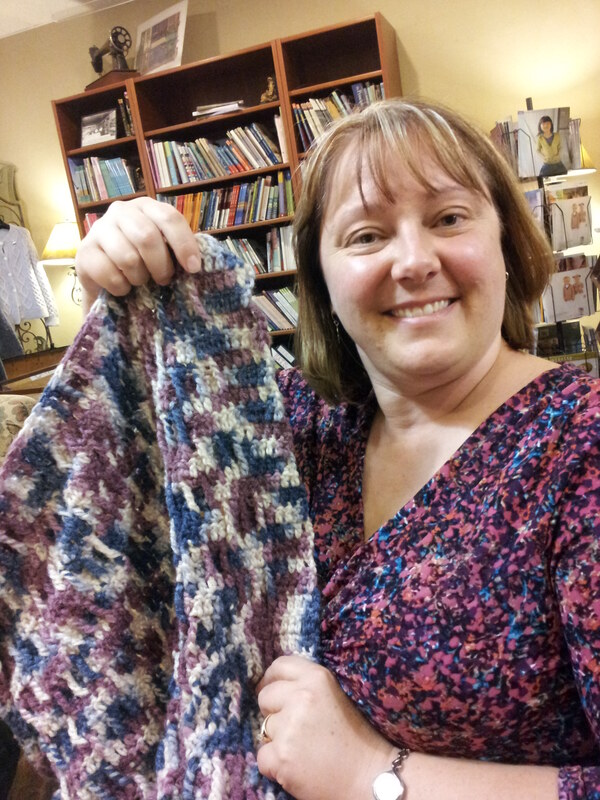 I didn’t really care for the yarn or the color, so that was a great surprise for me – I guess if we all had the same taste, the world would be a very boring place. I found a picture showing the afghan on my phone! 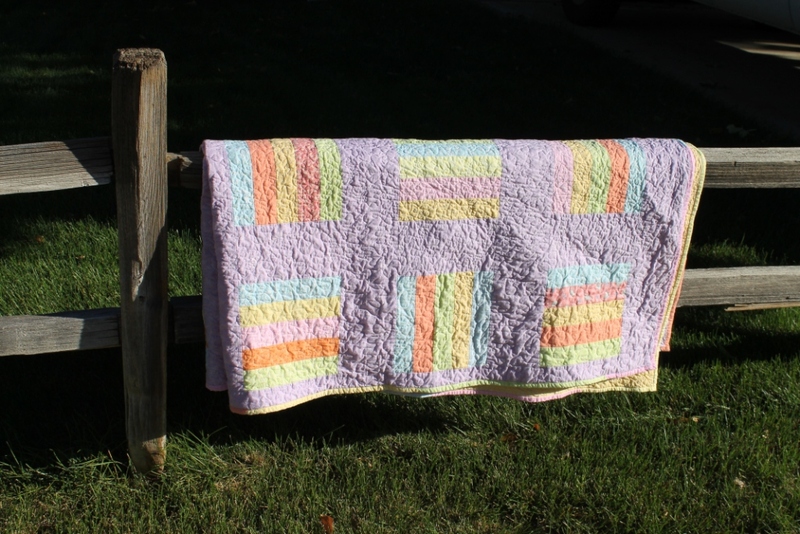 This quilt started out as something else entirely. 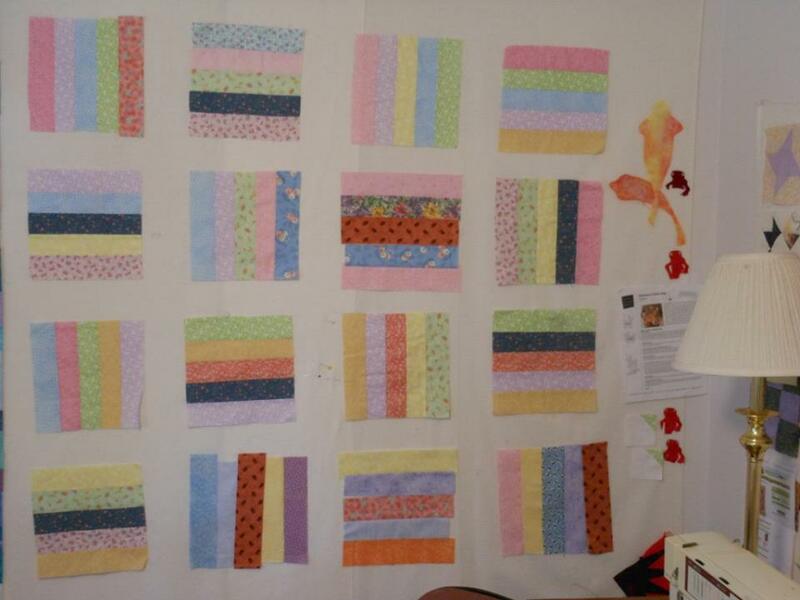 I originally intended it to be similar to this “Field of Flowers” quilt – but then I decided that there was no way I was going to get it done in time for the Bazaar. So I hopped on Pinterest and found “Counting by Fives” – which seemed more possible. The only fabric I could find that worked with all the other fabrics as a background was lavender. This was going to be a decidedly girly, Easter-y quilt. After getting the top sewn, I still had to quilt it. I do have a New Joy quilting frame, and a Juki TL98E machine, so, in theory, this should go quickly? Well, not if you have to rip out a full five rows because your tension on the back isn’t so good. 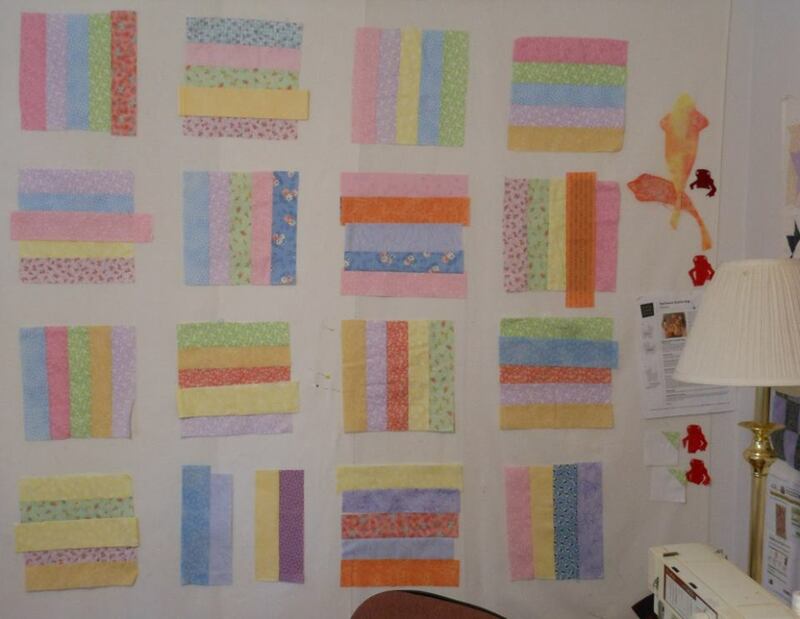 Now I have “new needle” on the check list for each time I start quilting a quilt. I did make a great discovery, I love Aurofil thread, and will be using that to quilt my quilts unless I find something more miraculous. It worked really well. The only problem is that the quilt store that carries it in the Denver area is WAAAAAY down south. 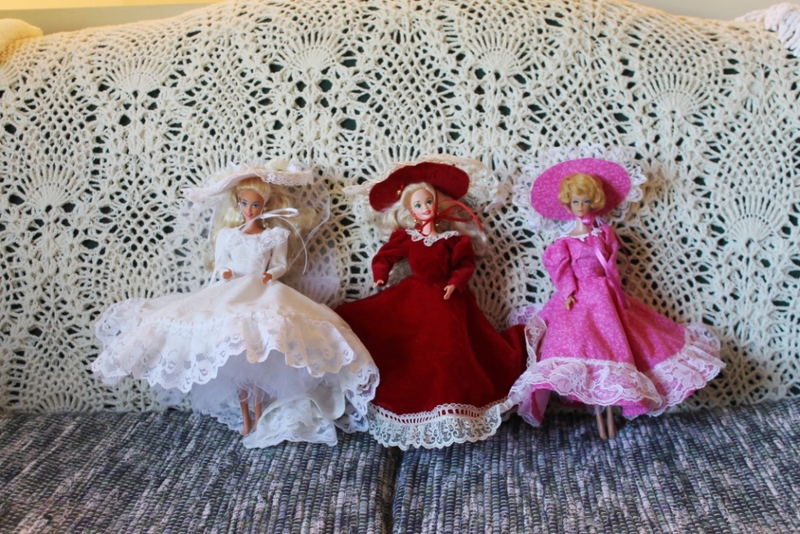 And of course there were Barbie doll dresses. 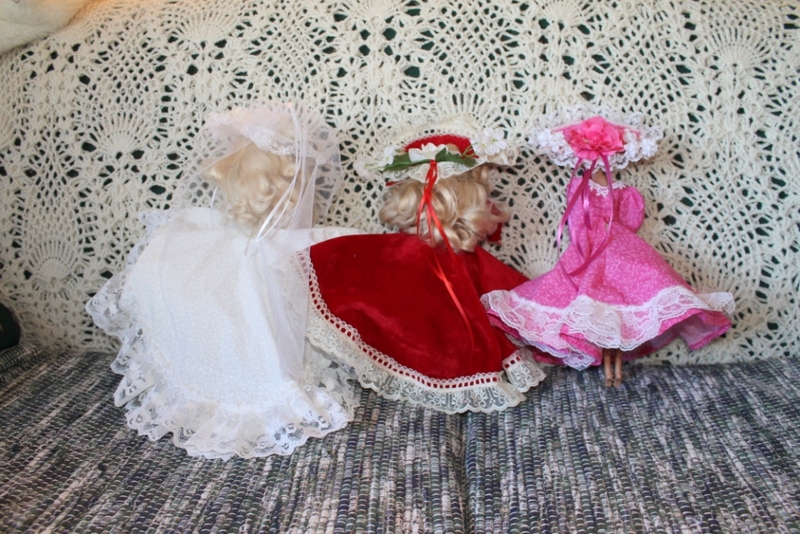 One of these got donated to the Soup and Pie supper rather than the Bazaar, since we weren’t sure the Bazaar would be re-scheduled. 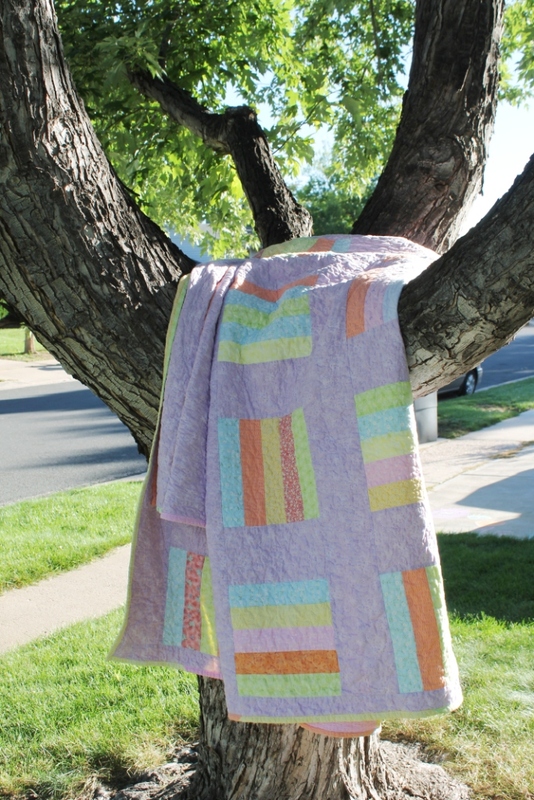 Western-themed receiving blankets and burp cloths. Again, I think one of these went to the Soup and Pie supper. 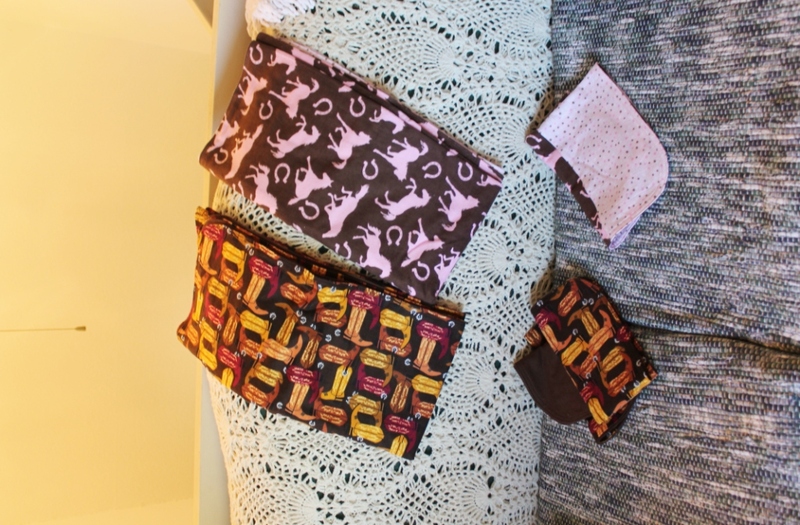 Horse pillowcases and crocheted potholders. The pillowcases went to the Soup and Pie supper, I already have fabric to make new ones for the Bazaar next year. My second-oldest niece also got a set of these for her birthday. That’s all for now, more catching up on sewing/crafting in a few days! What have I been crafting lately? Well, despite telling myself I wasn’t going to participate in Camp Loopy this year, I am doing it again. The first month’s challenge was to knit something with yarn you hadn’t used before, that was easy enough, but it also had to use at least 375 yards of yarn. I was also on a quest to knit something from one of my MANY knitting books, so I paged through a bunch of them, looking for patterns. I settled on the Lifted Stitch Scarf from Sock Yarn One-Skein Wonders, but a few rows into it, I could tell the yarn was not going to play well with this pattern, and I changed to the Ericka Scarf from the same book. 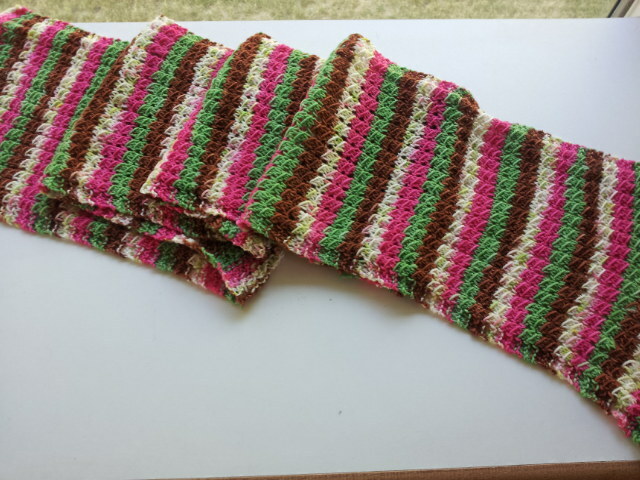 The yarn is Desert Vista Dyeworks – Viso Self-Striping in the colorway Spumoni. Yes, it did make me hungry for Spumoni each time I worked on it. I got it done before the June 30 deadline, because we were going to be gone to SD, and I wanted to finish and take pictures and get it uploaded to the Ravelry website. Here it is! 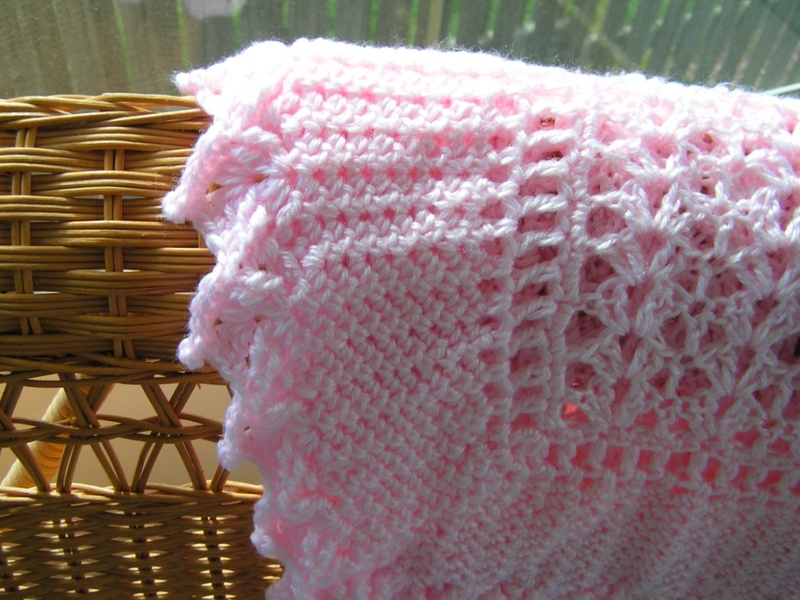 The challenge for the 2nd month was to knit a pattern that has been popular with other knitters, that you haven’t knit before. The project needed to have at least 1000 projects listed (or 1000 queued up) on Ravelry, and it needed to use at least 500 yards, single stranded. 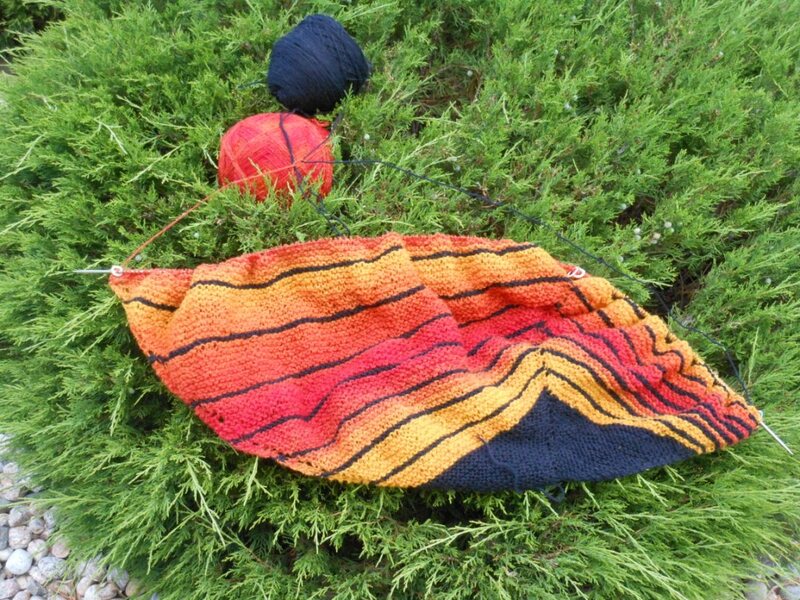 I chose the Stripe Study Shawl and am knitting it with Kauni – Wool 8/2 Effekgarn (orange/yellow/red – slow color change) and Cascade – Heritage Sock in Black. It has 12 asymmetric stripes, and I am on stripe number 8, but the stripes get bigger and bigger as they go, so I am only maybe half done. I HOPE I am half done. I really need some good thrilling movie to watch on TV to knit on this, since it is all garter stitch and it is getting kind of monotonous now. Or a Diners, Drive-Ins and Dives Marathon. Didn’t get too much knitting done this weekend, but it was for a great reason. Ken’s brother and his wife and little baby *welll OK, not so little* Owen were trying to fly home from South Dakota to San Francisco on Saturday. Because of the crash of the Asiana flight at the San Francisco airport, they were advised to go ahead and fly the first leg of their flight to Denver, but they weren’t going to be able to get any further than that, so they were stuck at the Mostek B & B for at least Saturday night. Ken got on the road to the airport and I went to the grocery story and got started cooking (overfeeding your guests as much as possible is part of my heritage). 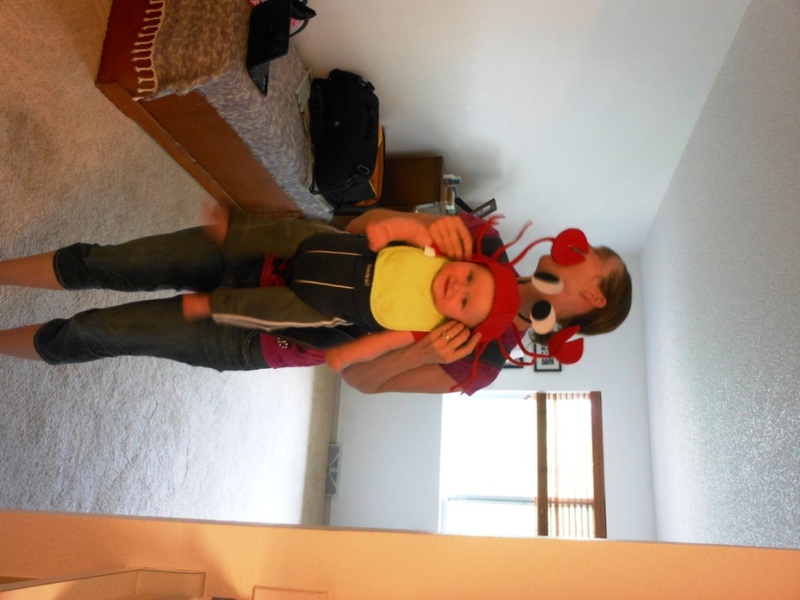 Only one picture of Owen on my camera, this is him trying on my crab hat! Will have to get some of him trying on the “mistake” crocheted hat that I am saving for one of my niece’s dress up trunks, it is pretty hilarious. We were lucky the house was quite clean since I had my knitting tea party (more on that tomorrow) and then I hadn’t been home much to mess it up, so we weren’t freaking out and vacuuming/mopping when we figured out they were going to be here overnight. Always great to see family, no matter how unexpected! Ken had never met Owen, so it was a real treat for him. The Wishbone is quickly becoming our favorite restaurant. I believe this picture is from the meal where I suffered a small “incident” wherein a bone from the piece of chicken I was trying to eat came unattached and then flew through the air like the bone at the beginning of 2001: A Space Odyssey. Fortunately it landed in our booth and didn’t hit some other innocent diner. I thought Ken was going to have a heart attack, he laughed so hard. 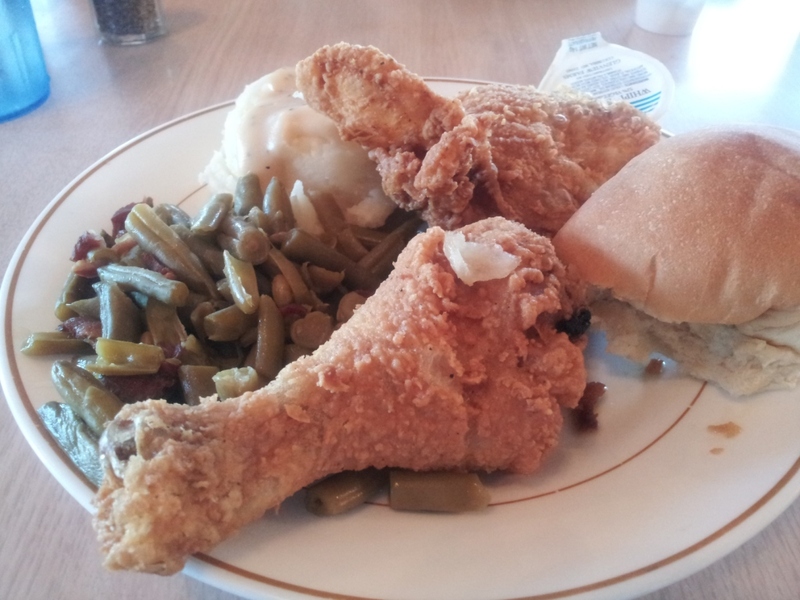 Wishbone’s fried chicken is my favorite fried chicken that I have had in the Denver area. It comes with mashed potatoes (from a mix but good) and neon yellow chicken gravy. 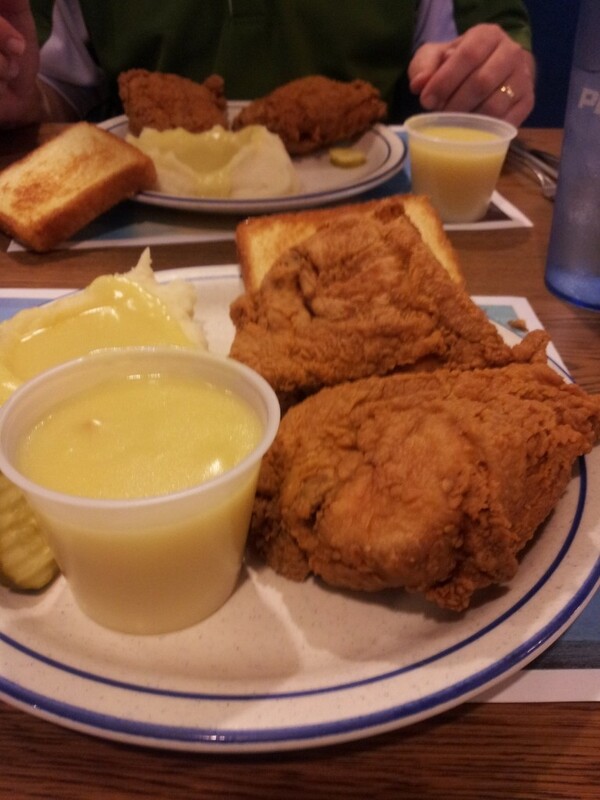 You get a cup of extra gravy, to use as you wish, whether you want to dip your Texas Toast in it or just drink it. 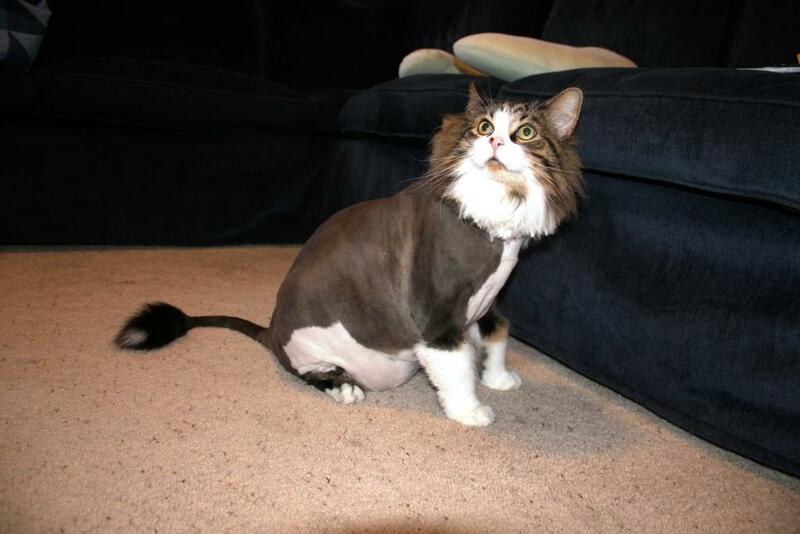 I have learned that the best thing for me to order is the 3-leg dinner. If I get carried away and order soup as an appetizer, I get too full. Ken really likes the chicken tenders. Last Friday was National Fried Chicken day, so of course we had to eat there, with my friend Cathy who is also a Wishbone fan. He actually seems to enjoy being cooler, and of course he gets all kinds of attention from us. And attention is what he loves best. I don’t just eat fried chicken at the Wishbone. I am willing to try others. I was on a work trip and we ate at the Southside Restaurant at Limon. I think everyone else had the chicken fried steak, but I was very happy with the fried (broasted?) chicken. Real mashed potatoes. Nice warm roll. 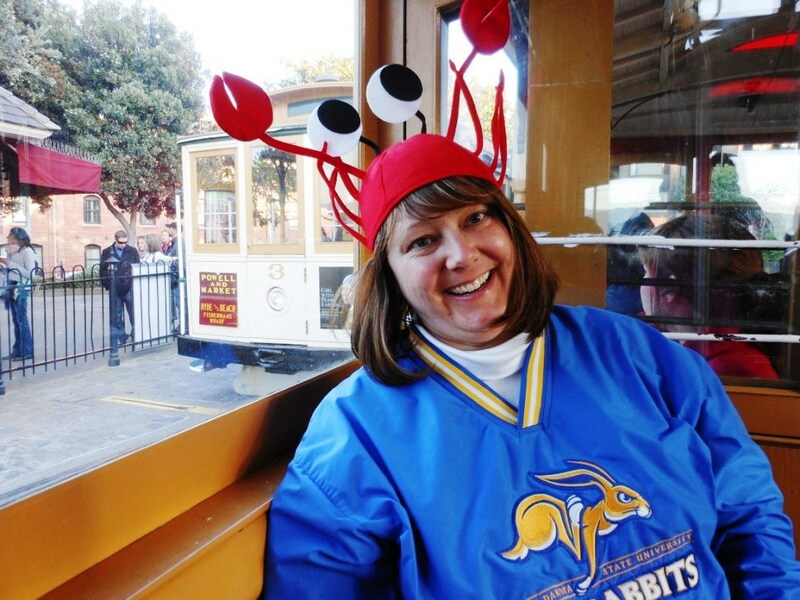 We did not have the crabby waitress experience that several people mentioned in various online reviews. On the same trip, we ate at Shorty’s in Granada, Colorado. This is a hole-in-the-wall Mexican restaurant, family-run, not the cleanest, but there are not a lot of dining choices in Granada, Colorado. 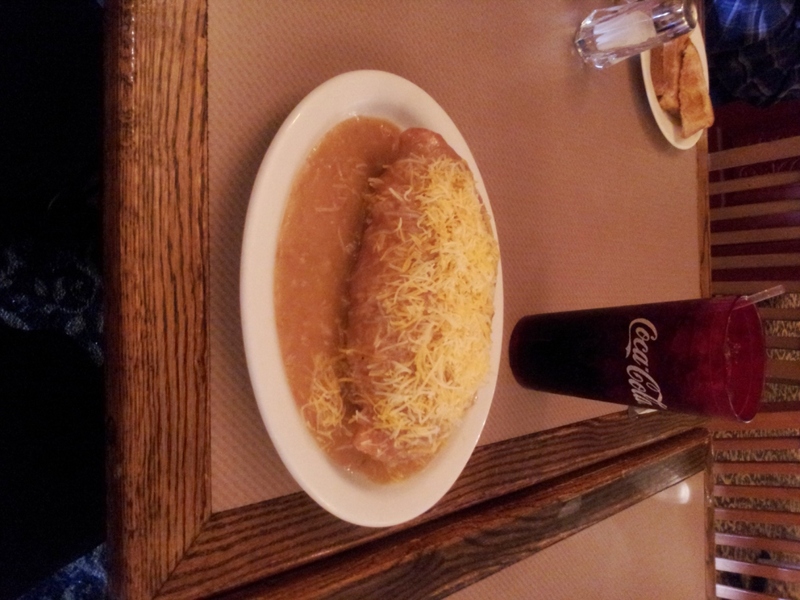 I had to have the nacho cheese enchilada along with a regular enchilada. They were both tasty. No free chips/salsa here, but you do get a free serving of ice cream at the end of the meal. And free entertainment if the family’s 4-year-old daughter is there. On work trips, we usually eat at Chez Du Vall’s in Granada, but it was closed on this particular day. Chez Du Vall’s is quite a good restaurant, we have had many meals there with meetings and with trade teams and have always had good food. That evening, we had a dinner meeting at The Route steakhouse in Burlington, Colorado. They always have good food, too, although I recommend sticking to what they are best at: steaks. The next morning, our meeting was at Dos Hijos Mexican restaurant in Keenesburg, Colorado. They opened early for us to have our meeting. They have a breakfast menu but usually don’t open until 10:00 a.m. Well, when I see something like “Breakfast Stuffed Sopapilla” on the menu, I have to have it. It was pretty good. Their spicy green chile is actually spicy, which I am in favor of. 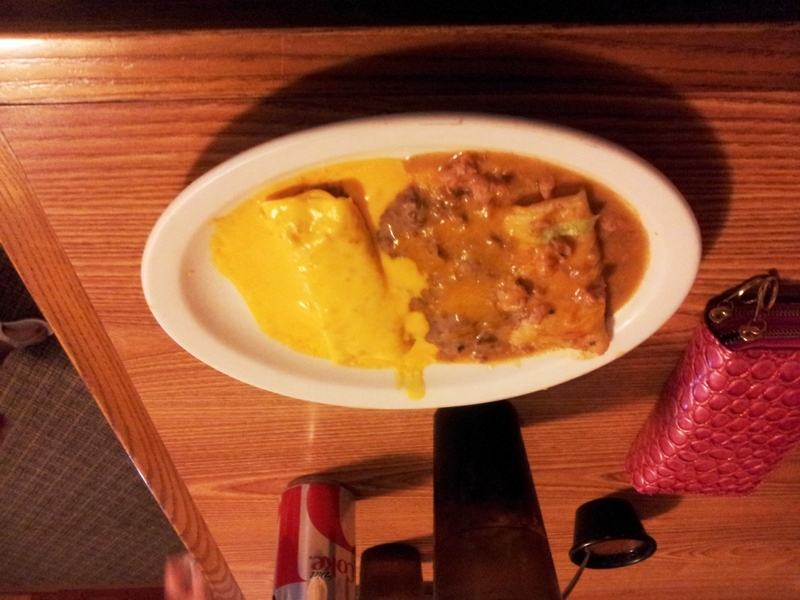 The sopapilla is stuffed with your choice of meat, plus eggs and potatoes. 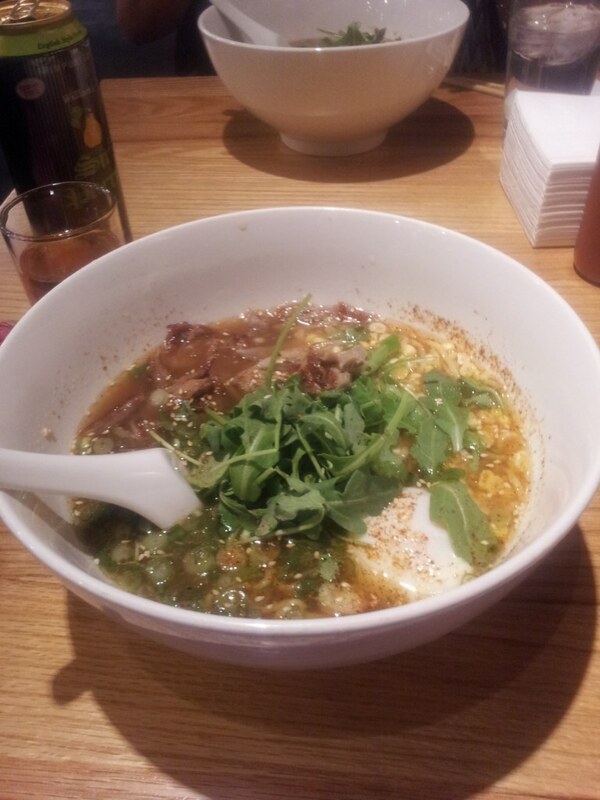 It certainly filled me up. We didn’t have a lunch meeting, so we ate at the Home Plate Restaurant in Fort Morgan, which I would also recommend. 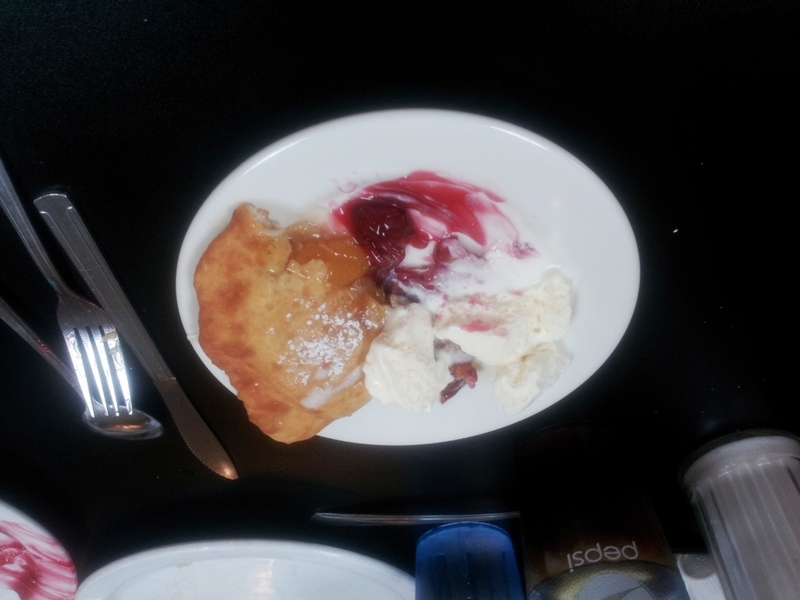 I just had soup for lunch, because I was saving room for the dessert fruit-stuffed sopapillas. 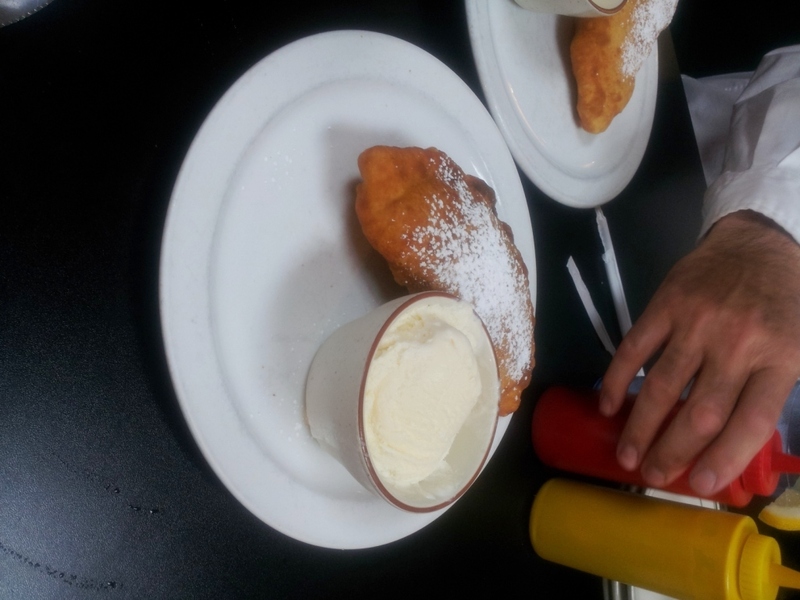 It was a sopapilla kind of day. We shared peach and cherry around the table. They were Amazing. Do not pass up the vanilla ice cream with them. All in all, another tasty trip around Colorado. 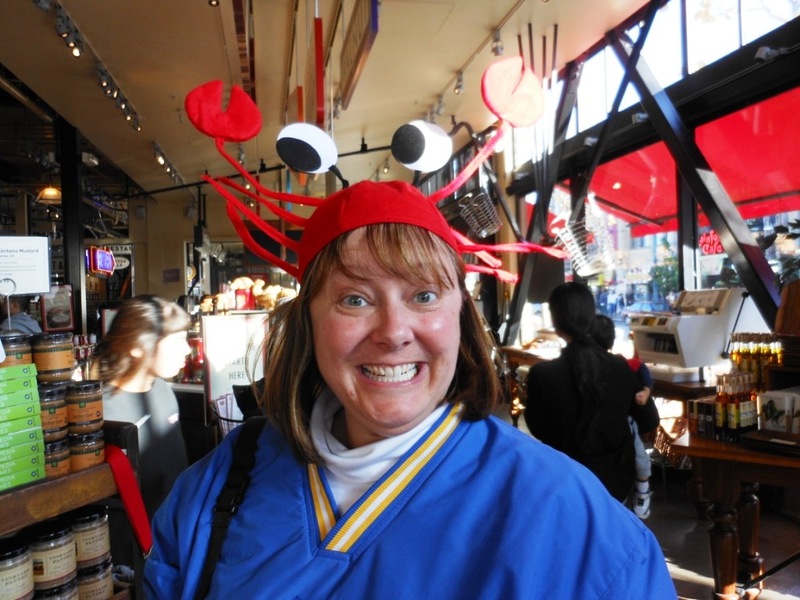 For lunch, we went to the Crab House at Pier 39, Fisherman’s Wharf. Oh, this place was amazing. 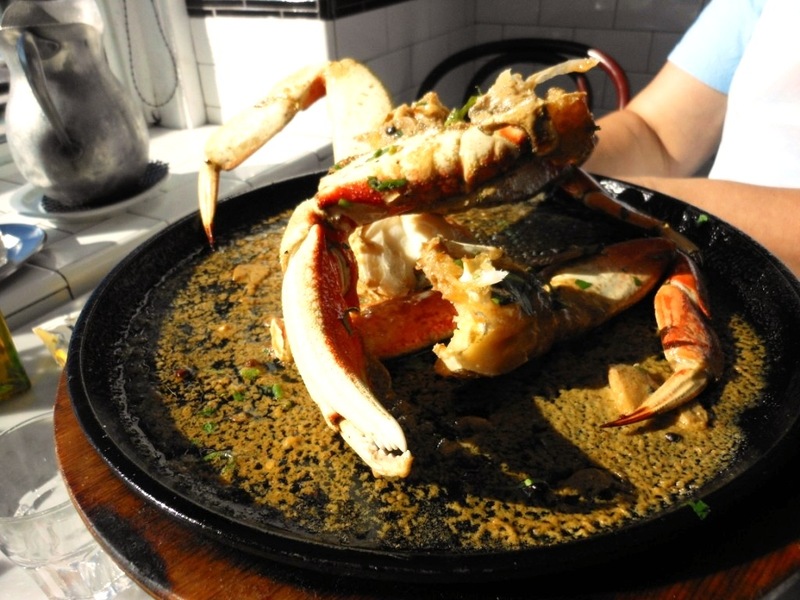 I have been craving crab ever since we ate there. I had the clams cioppiono, delicious. My friend S. had something for herself, I no longer remember, but I do know she liked it. AND we shared a 1/2 order of the Killer Crab in their roasted garlic sauce. Amazing. Then we went and looked at the sea lions at the Wharf. And then we went shopping at the Boudin Bakery gift shop . . . which is when fate brought us together . . .
Me and the . . .
Of course, I purchased it immediately, and it accompanied us wherever we went. On the trolley. The same TERRIBLE busker was there singing again. I warned S. but this is something you have to hear to believe. 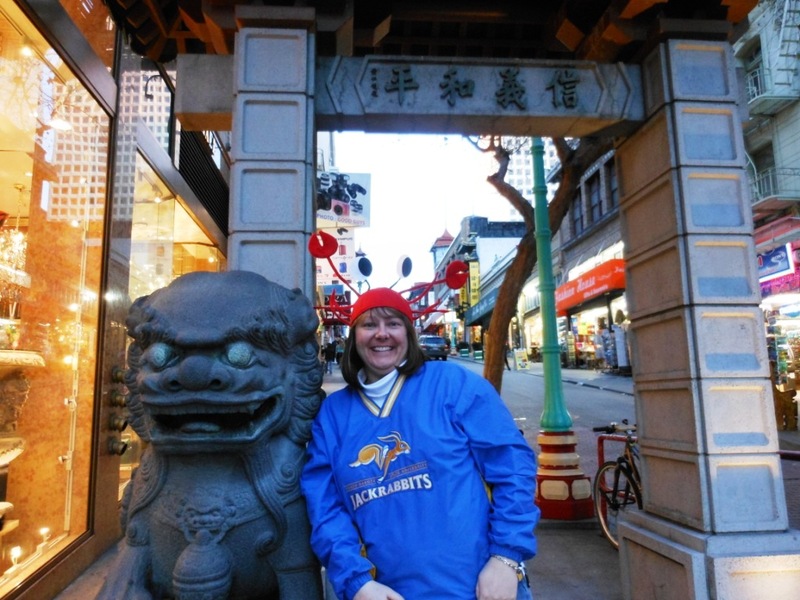 We were in Chinatown because we had a dinner recommendation from another friend to eat at the House of Nanking. 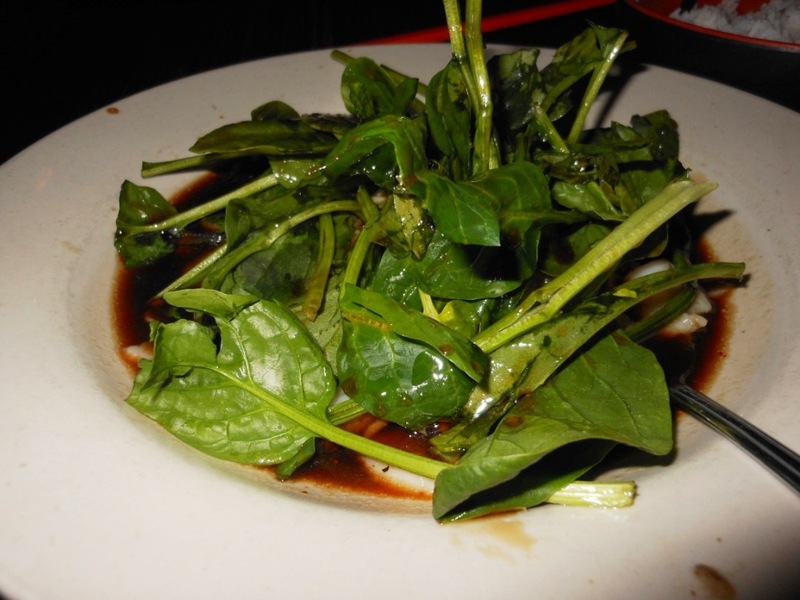 It is a small, kind of hole-in-the-wall place, but has a lot of character and really good food. 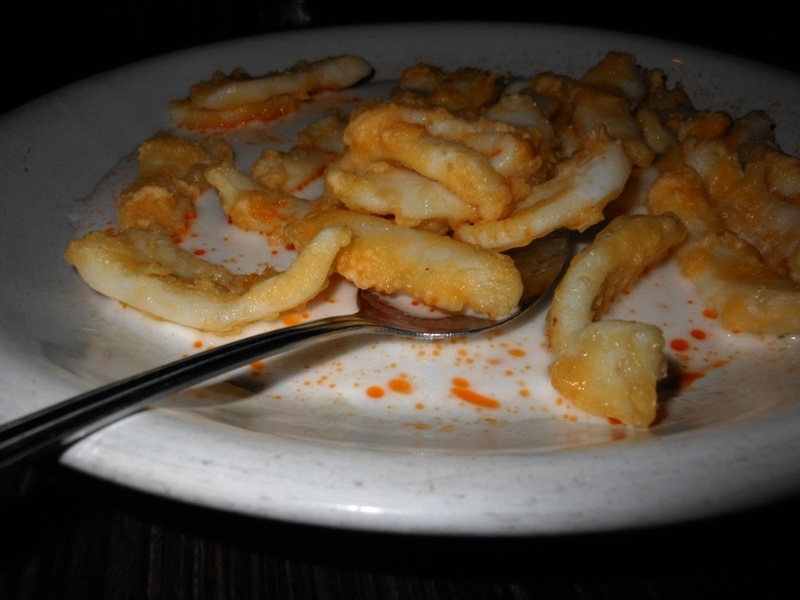 This calamari was different than any I ever had before, it was not heavily breaded and it was in pretty big pieces. Good, though! 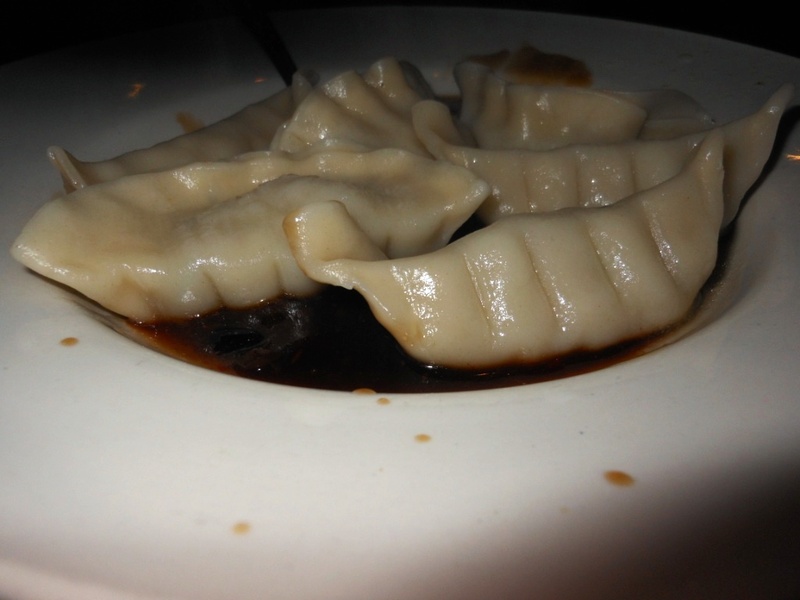 They were also delicious, but we have never had dumplings as good as the ones at the conveyer-belt sushi place in Spokane…. And then I had the Garlic Ginger Poached Scallops, and S. had something else too, or maybe we were just happy with all of this….apparently I didn’t do as good a job this trip getting pictures of everyone else’s food! Lots of nice greens with these, you can hardly see the scallops. 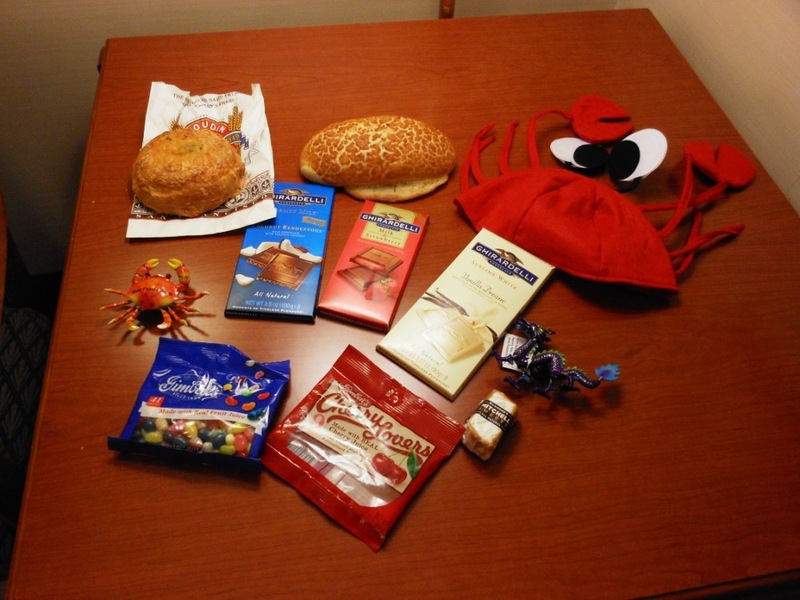 I like to get edible souvenirs, if you hadn’t noticed. All of those jelly beans, and the ghiradelli chocolate, were wonderful. 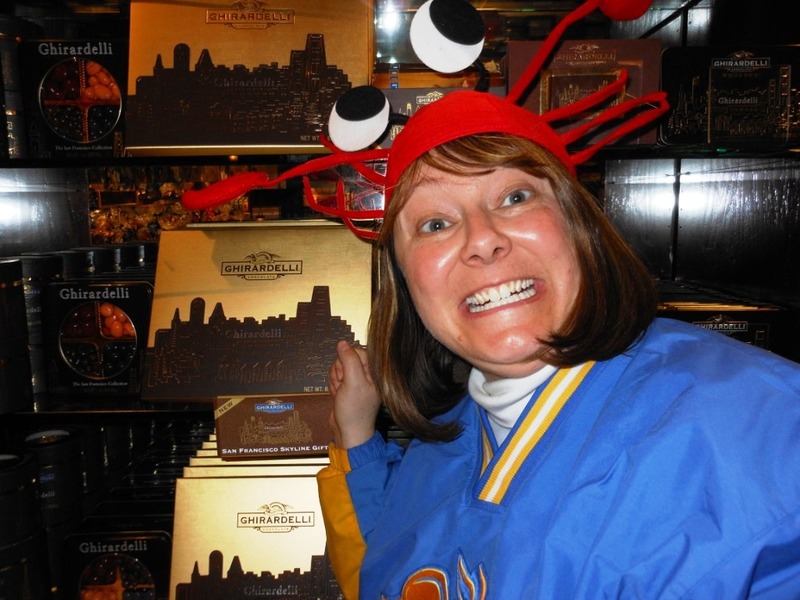 S. and I did have to traipse all over Chinatown to find that crab magnet again, I greatly appreciate her patience there. I should have purchased it the first time I saw it. The dragon magnet also is springy and bouncy. The cinnamon bread and jalapeno cheddar roll from the Boudin bakery were also great. And I do believe I bought a peanut butter cookie there also, but it was already gone. This trip may have led to a small obsession with peanut butter cookies for a while. 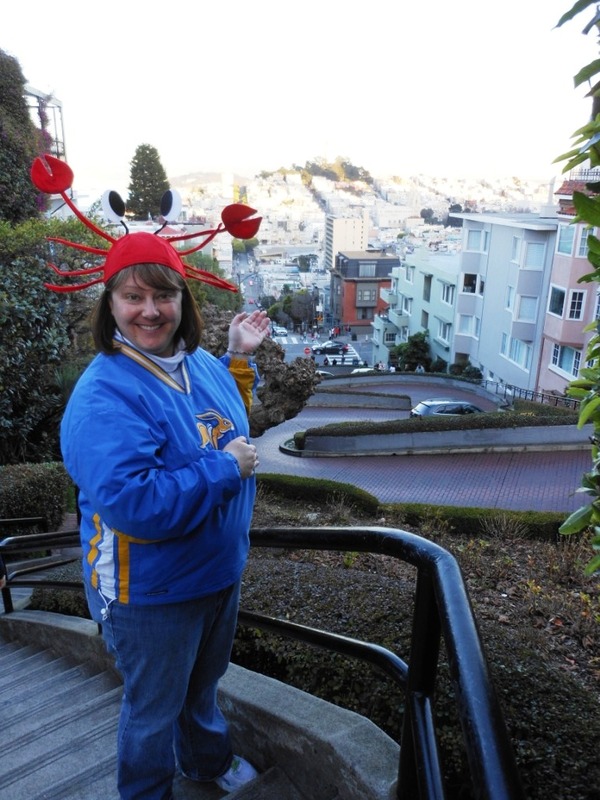 And of course the CRAB HAT, best souvenir ever! S. left the next morning, and I hung around so that my brother-in-law could come get me and I could get to see my newest nephew! My brother-in-law N. took this picture, and it pretty much sums up how I feel about the nieces and nephews. Awwwwwww.